The title of this piece almost gives away my thought and working process. To explain – I was mulling over many possibilities for this subject and getting nowhere, when I found a couple of pieces of fabric in my ‘scrap bag’ which sparked an idea. This was to work a piece without a design, but by using fabrics from my scraps which were pleasing and from which I would derive motifs and inspiration. Therefore my finished piece would be a surprise to me! Once I had worked out a pleasing arrangement of fabrics, I bonded these to the background ‘raw-edge’ style, before adding stitching to secure these to the background and to add some texture and interest. I found that in this process I was echoing the geometry of the patterned fabric (which is where the ‘geometry’ in the title comes in). I then added the batting and backing and used both machine and hand stitching to quilt the whole piece. 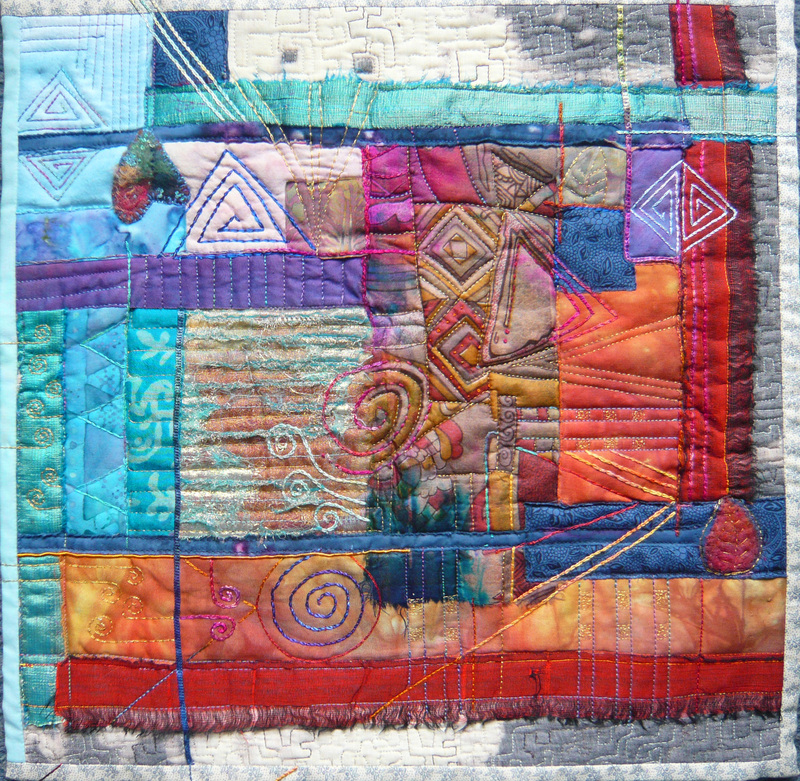 I continued to use the geometric shapes where possible as part of the quilting. The outcome was a surprise to me, so I guess that the original idea worked! A very original approach which has worked well! I must try this method of working! The outcome from starting with fabrics to give you inspiration really worked. Great quilt. Bright colors and original approach. iI like the composition of your piece. 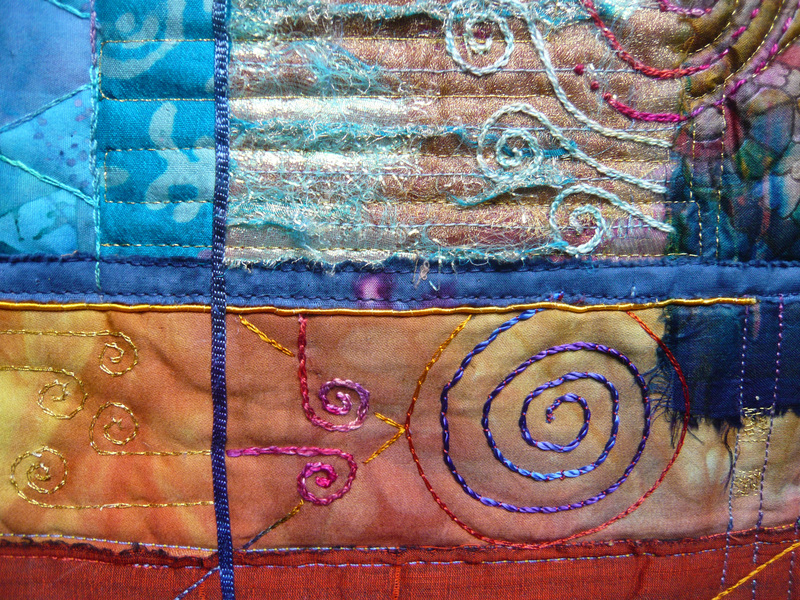 I agree that your original idea worked very well, the quilt is further enhanced by your lovely hand embroidery. It seems your are two themes ahead, ha, ha. 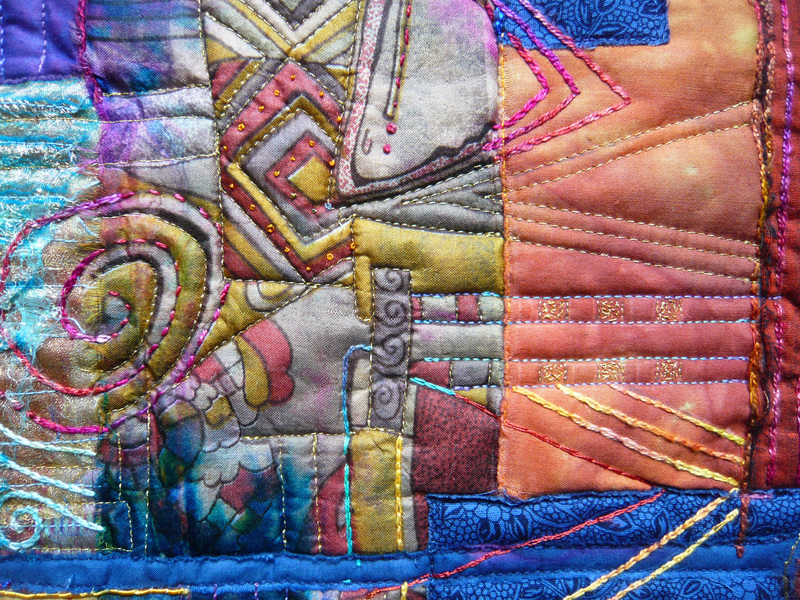 Nice colors and the use of machine and hand stitching.